The New Harmony Health Food Store use an eCommerce style website from Western Webs to provide an online presence for the Tuam outlet. In addition, the business need to promote the range of products offered in its online store to a nationwide customer base. As a result, the website is also optimised for key product related terms to maximise online search capability. The New Harmony outlet is an independently owned health food store based in Tuam, Co. Galway. As a result, they offer a range of products, such as organic and diet specific foods. In addition, they supply traditional supplements and herbal remedies. They also provide a wide range of skin friendly beauty products. The goal is to provide the customer with everything they require and deserve to live a happy and healthy life – in the most natural way possible. The eCommerce website is built using WooCommerce shop software with a WordPress front-end. In addition, it is mobile responsive, optimised for fast loading performance and hosted in Ireland. 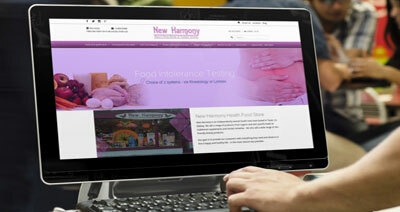 Click to visit New Harmony Health Food Shop website.